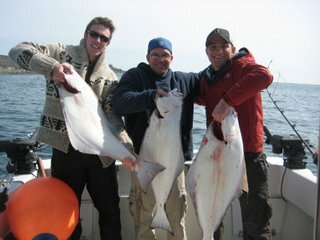 The halibut fishing has been excellent from off Victoria all the way past Sooke to the west. So good that not many people are chasing salmon. The Ben Seaman party had a good time on a recent halibut fishing trip off Victoria: "Thanks to Trevor with No Bananas Charters - he took three of us out and we each caught a 30lb halibut. Great boat, great gear, great guide. We had a blast!" 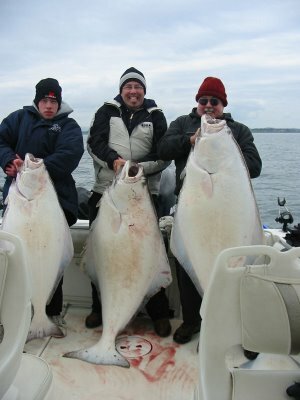 Trevor also provides a photo of Gord Grivel with a pair of 50lb halibut from a quick morning fish off Constance Bank. Probably pretty clear from the pictures, but he reports "Halibut fishing continues to be very good". 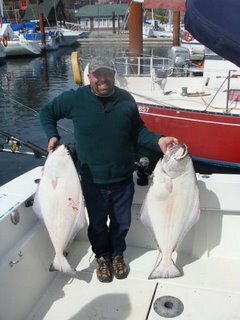 Roy from Blue Wolf Fishing met with some success too...taking out Terry and gang from Medicine Hat, Alberta, and getting them into some nice looking halibut. Their report "We put in 2 days with the big bad Wolf and I must say it was awesome. Roy was able to put us on some dandy fish. This being my first Hali trip kind of set the bar high but you never know there is always the big one next year. Brought out a friend of mine that was never out on the chuck before so it was a real experience for him. We came home with a 70, 42, 37, and a 25 pounder and Roy was able to bring one in for himself a nice 22 pounder for some fresh fish and chips. What can I say Wolf we had a great time and it was an awesome experience once again you came through with some great fish and a ton of laughs always a great time." Finally, Gord from Foghorn Fishing sent in the following picture of a "family affair"...Gilles in the middle with 85lb, Lawrance on the right with 73lb and Charles on left with 40lb...a happy family from Alberta that come out to fish Victoria's waters with Gord each year.